Water bottles have a simple use and that is to contain or transport water. But when you’re looking for the most effective one, it can be quite a search. So, we’ve rounded up a list for you to choose the best insulated water bottle. Each one has many functions and design to choose from. Insulated water bottles bring so much convenience because you get to keep cold water in hot weather. Now that there are many different brands available, but we’ll be helping you to find the coldest water bottle that you can use in your activities in this post. We’ll be going through some quick guide and tips on selecting a good insulated water bottle and also look at which are the best insulated water bottle you should be buying. Let’s get started. What Is An Insulated Water Bottle? An insulated water bottle is a portable container for liquids that can keep the proper temperature for a long time. This means you get to enjoy warm or cold liquids longer. This is achieved by having the double wall vacuum insulation that was originally used by Thermos products in the past. Now, many manufacturers are using this innovation to design the insulated water bottles that we have today. The science behind in keeping the proper temperature in insulated water bottles is the double wall vacuum feature. When the liquid is in the water bottle, there is dead air space between the liquid and the outer layer of the bottle. The space between the double walls acts as an air pocket, efficiently insulating the contents of the bottle and not allowing heat to transfer inside. Therefore, it keeps the temperature the same because there is nowhere for heat to transfer to. The real insulated water bottles should have this feature to keep drinks hot or cold for a long period of time. 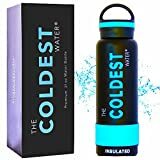 The Coldest Water Bottle is a well-known brand of insulated water bottles that keeps water cold for 24 hours and beyond. The design is a simple but with the word “coldest” written on its side. It is a 21oz bottle and there are many other colors to choose from which can fit your style. However, there is also a 64oz size available for those that need a bigger water bottle. This vacuum insulated bottle is made with 18/8, stainless-steel so you’re sure that your drink is effectively stored to its coldest temperature. This bottle fits most car cup holders and it also floats, meaning you can take it with you when you swim! True to its name, its great quality makes it effectively the coldest water bottle. This Healthy Human water bottle has so many colors available, you won’t have trouble standing out. It has a maximum temperature retention feature because of its double wall vacuum insulation that makes it keep liquids cold for 24 hours. You can even keep ice in it for 24 hours. This double walled stainless steel water bottle is made with the best quality materials that will keep your drink safe. It is made with food-grade stainless steel with a tight-sealing lid that is 100% leak-proof. You can bring it anywhere using its handle and the carabiner makes it possible to attach onto anything. This water bottle has many sizes available start from 16oz up to 40oz. The Flow water bottle comes with 3 lids which you can change depending on what you need and what you prefer. These are the straw, the wide mouth, and the flip lid which can make drinking easier for you. You can clean the lids easily because they are 100% dishwasher safe. It is also made with high-quality, BPA-free stainless steel that keep your drinks toxin free. The size is just right as it holds enough fluid to satisfy most of your needs. It has a premium no-sweat coating that prevents the bottle from sweating. If you purchase this product, it comes with a warranty which we doubt you’ll ever use. Also, this water bottle only available in 32oz size. 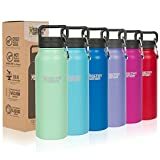 We go through hundreds of products listing at Amazon and also study the ratings left by previous buyers to find the best insulated water bottle for you. Besides that, we also calculate the overall net ﻿﻿﻿customer satisfaction (NCS) grade because we want to see how happy is the previous buyers with their purchase of the product. From our finding, we can say that The Coldest Water, The Flow and Healthy Human are the best insulated water bottle brands. These brands are popular and received many excellent ratings for their products. Also, the The Coldest Water Bottle, Th﻿﻿e Flow Stainless Steel Water Bottle and Healthy Human Water Bottle score favorably for the ratings as well as the NCS grade compare to the rest. We believe that you would find these insulated water bottle a good buy too. If you want to get the best insulated water bottle, then you have to know what to look for before purchasing one. The best insulated water bottles are made with 1﻿﻿8/8 or food g﻿﻿rade stainless steel. These are BPA-free and should not contain any toxic chemicals. The stainless steel material is perfect for the double-wall vacuum insulation feature and is very effective in keeping the temperature. Other than that, it makes the bottle very strong and durable. Stainless steel is the material used for insulated water bottles and manufacturers add a powder coating on the outside which can avoid dents and scratches. These make the bottles very durable and last long. Many good tumblers are also made with the same material like the tumblers you can fin﻿﻿d here. One thing you also have to consider is the size of the bottle that you want. How are you going to use it? Where are you bringing it? Will you put it in your bag or in your car? Water bottles have a wide range of sizes for different purposes. Some range from 12oz up to 40oz. You can also purchase more than one size if you need to. A bottle handle can be very useful which is why it should also be a consideration. You can easily bring your bottle or attach it to your bag depending on the handle style. There are also different handle materials but it’s best to stick with plastic or metal for durability. Insulated water bottles come in different types of bottle mouths. The width can vary and choosing can just be based on personal preference. A wide bottle mouth can be used if you like taking large sips or place to include ice in your drink. This size can be scrubbed and cleaned easier. However, if you want a smaller sized bottle to easily fit in your bag, then a narrow bottle mouth will work better for you. Picking the style of your bottle can also be influenced by how you’re going to use it. Do you want it to be small or big? Are you going to use it for hiking or for work? What color and design do you want? There are many different styles to choose from and since you’ll be using your bottle a lot, it’s nice to personalize it. Like we said earlier, you can use your bottle not just for water but also for any other type of liquids. However, this can cause gunk and build up in your bottle as you use it. With this, you have to clean your bottle regularly. The best and most effective way to do that is to use a soft bottle brush or sponge and some baking soda and vinegar to clean out the buildup. Instructables have an excellent post on the steps to effectively clean a water bottle. Check out the post, here. Now that you have discovered the different uses of insulated water bottles, it is a definite must-have at home. You can use it anywhere and anytime, and still get to enjoy your ice-cold water. There are many good double walled stainless steel water bottle that you can choose from our list, which we carefully picked out from all the other best insulated water bottles in the market. Let us know which one if you favorite by commenting it below.